This morning I unboxed a new phone. It’s not mine. It belongs to @VodafoneUK and they sent it to test me. I’ll have to give it back but in the meantime it’s mine to explore. To see if I can use a different handset to the iPhone4 that never leaves my side. I am already in deep with Apple and their iOS. I have used an iPhone since @SleepyDog kitted me out when they first arrived. It seemed the sensible move as all my computers are Macs. So, during a conversation with @Dan_Bowsher he asked me if I thought I could do what I do with an Android device. I said I doubt it. Not one to miss a trick I think Dan has got me testing this (and it testing me) in time with Vodafone UK stocking a bunch of new Android devices. 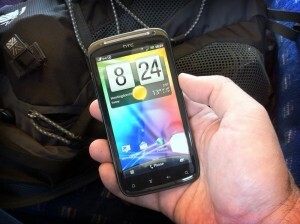 I chose the HTC sensation despite it sounding like a LadyShave (or other hand held vibrating device) because it’s specs seemed pretty neat. It seems to do everything. Check out HTC’s own site..
My first impressions were.. “Who the hell has had this phone before me?” It looked a little like it had been smuggled across a border in a pizza. I cleaned it up easy enough and it shone. The camera lens on the back sits in a recess and needed a little extra cleaning. I am not keen on recessed lenses on devices designed for your pocket. they tend to attract fluff and you don’t get to find out till you have missed your shot. It feels smooth and weighty in the hand and after a charge from one of the many micro-USB leads I have dotted round the house, I popped it into my pocket until I boarded a train this morning. I have had a little play and it seems fast. Really fast. I don’t have the instructions with me but it’s intuitive enough for basic operation. I’d love for some experienced android users to let me know some tips and tricks.. Like saving bookmarks as web apps to the screen and suchlike. All i have done so far is use it to browse Google+ which looks neat and tidy and the screen resolution is more than enough. The phone feels a little right handed with the home button on the bottom left requiring a little more effort than I am used to to reach it. Twitter seems to be integrated so the first app i downloaded was Audioboo followed by Gowalla. They both look ok but i’m currently travelling through tunnel after tunnel and so will have to test fully later. Anyway. So far so good. I have yet to make any media, take a photo, buy an app (Gowalla and Audioboo were both free and no card was needed.. unlike Apple) so all the real testing is yet to come. I still have no idea how people get their media.. i.e podcasts, music and films on their Android devices. It’s been so long sine I have had anything that doesn’t sync with iTunes. That for me will be the real test. Some things to try:Googe Maps and Navigation. Turn-by-turn directions. Also is real-time traffic aware. Hope it’s available in UK.MightyText : get a beta invite. Integrates texting with MightyText Chrome extension on your desktop browser. Awesome. You can text out from your browser and they show up on your phone, too.Google Mail of course. Should have come pre-installed.Bar Code Scanner – unimaginative name but great performance for QR code scanning.MyTracks – works with google maps to trace walks, hikes or any other kind of travel.SuperGenPass – Not as easy as the SuperGenPass bookmarklet, but allows you to generate your hashed passwords and the paste them into the appropriate login forms.LightDroid – turns your phone into a flashlight – or what you lot call a torch. :)BluetoothChatBluetoothFile transfers – I’ve heard iPhones don’t generally let you download files since it doesn’t have a user-visible file browser (true?). Anyway, I like this feature with my MacBook.Android devices can download and insert vcards from web pages, which iPhones cannot (for the above reason, I’m told)Files browserGTasks – a handy integration with the Tasks feature of GMail.Talk – an Instant Messaging client that integrates with gTalk.GasBuddy – Location-based Crowd-sourced price info on gasoline prices. Also allows you to search any location you like from its database. I’m sure there are zillions more, but I’m not that much of an app investigator. Will be interested to see what others might add! I know it is still in beta and you might have trouble getting in on it, but Swype is worth using. Swype has been completely integrated into Android now. At least it is on my droidx. It’s great!! How could I have forgotten that?? Thx jdl0301 !! Doggcatcher for podcasts. Check out xda developers for forums related to your phone and root it. i know u like lists of things so here you go: download “listen” for audio podcasts. uses the listen folder in google reader. “newsrob” as a text RSS reader (integrates with google reader). “Superious” for editable posterous blogging (not pretty but useful alongside the official posterous app). “docs” if you use use Google docs. “little photo” and “vignette” camera replacements. “urly” for URL shortening and quick posting of assets to various (if not all) sites including posterous. turn on instant photo upload in g+. use “swype” as a keyboard if you can get used to it. “SMS backup” to backup your SMS to your gmail account. “where’s my Droid” for a way to get your phone to SMS you its location if you lose it. marvel at the extra functionality in Maps. use google places via g+. start rating places. “quick settings” for a way to change settings quickly from the notifications bar (as the name suggests!). start using gtalk as it was meant to be used, ie as replacement for sms. “team viewer” for remote desktop access. remember to long-press the screen for context sensitive menu. long press a bookmark in the web browser to add to home.copy music to the SD card music folder buying just copying the files, not syncing with anything.use spotify if you like.marvel a little more at the extra maps functionality and driving directions.get annoyed at the fact that the camera is not as good, and that there is no instagram.marvel at “huddles”hmm games… well just one for me. “burn the rope” and “cut the rope”. ok thats 2want more? Thanks @Ilicco Some great apps listed. I’ll get on it tomorrow. Google+ and Audioboo 🙂 my tips for you mate. interestingly I abandoned iOS for this phone and it is what I use now. Took a while to get used to and less help in finding new apps – so these are great lists! The battery is a PAIN, but make sure you get JuiceDefender to help with that, plus with HTC you can buy extra batteries (though mine cost £20). What do you think of it now? Hi, @Thirstforwine I find the keyboard awkward & it doesn’t feel quite right with the workflow but it’s still early days. Certainly a well made phone and makes the iPhone feel a little old. he he – true! Imagine how I felt, moving straight to it from my 3GS :)I didn’t like the keyboard at all until I added swype – have you got the beta yet?